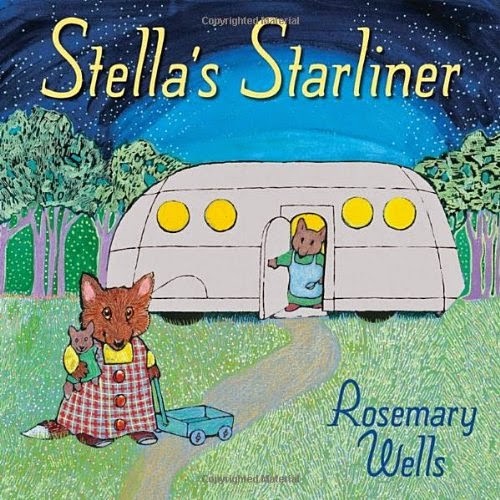 Stephen and I really enjoyed Rosemary Well's newest book, Stella's Starliner, which tucks a deep message into a sweet, sparkling picture book. I grabbed it off the library shelf because I grew up with Wells and I thought from the title this one might include some imaginary space travel. Actually, the story is mostly grounded on earth, with one fantastic sky travel scene in the middle. But I still highly recommend this one! Stella is not rich in material possessions, but has a life rich with pancake breakfasts, farmer's markets, bookmobile visits and weekend fishing trips. Her compact but practical trailer home is replete with fun hiding places and novelties like a sofa that converts to a bed with the touch of a button. Cherished by her mom and dad, Stella feels secure in knowing she "had everything she needed in her silver home." It seems nothing can shake her idyllic childhood until a band of sneering weasel bullies berates poor Stella and her silver home. Their jokes "stung Stella's heart like the sting of bees." (After just one read through this book, Steve recited that line back to me in a very serious voice.) I always thought that the old rhyme about sticks and stones and words that can never hurt me was unhelpful, especially when it seems that words are what can most damage a tender heart. In Stella's case, the weasel's jibes pricked so deeply she couldn't eat or sleep that night. I won't give away the ending, which, of course, is a happy one. The message of this story? Just as cruel words can cause people to see their glasses half empty, some encouragement can set things right. Always on the look out for books that promote simplicity, I was happy to find another book can help children see that happiness is not in wealth, having stuff or pleasing everyone. It also promotes loving family relationships, finding joy in the little things and speaking positively. So go out and get Stella's Starliner, and start talking with your pre-K to early elementary students. Review of "Letters from a Skeptic"
Reflections on "Half the Sky"